Disclosures this summer about President John F. Kennedy’s 1963 assassination are prompting a blistering dispute on whether new "scientific evidence" proves that Lee Harvey Oswald killed JFK as a lone gunman — or whether the claim against Oswald is part of an ongoing media cover-up of the truth. Several other prominent researchers, including acoustics expert Dr. Donald Byron Thomas, also have strongly criticized the Sabato-Shenon columns, which suggest in part a highly controversial theme that Cuba Communists may have supported Oswald. The Politico article, How the CIA Came to Doubt the Official Story of JFK's Murder, was published in print on Aug. 3 and followed a similar column here that Sabato and Shenon co-authored for the Washington Post on July 25. Both columns followed the National Archives release on July 24 of some 3,810 previously suppressed JFK assassination records. In a law passed unanimously in 1992, Congress started a process that requires these and other remaining documents pertaining to the Kennedy assassination to be disclosed by Oct. 26. The National Archives staff has suggested that at least one more document release will occur by then. Some four million pages of other documents have been released previously. These previous releases have provided the public with an increasingly complete picture of a murder that changed American history in many ways extending to the present. 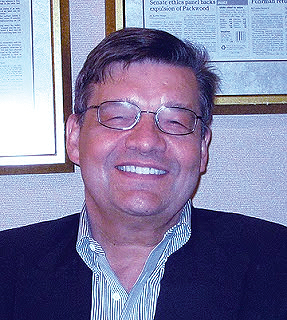 Kyle Kondik, a colleague of Sabato's at the University of Virginia, instructed Wecht that if he wants proof of Sabato's scientific proof Wecht should read the books published in 2013 by Sabato (The Kennedy Half Century) and Shenon (A Cruel and Shocking Act). Kondik is managing editor of "Larry Sabato's Crystal Ball," which is affiliated with the Sabato-run Center for Politics at the university. Television and cable news outlets frequently host Sabato to speak about current events. That celebrity helps generate many invitations for Sabato and Kondik to share their views for print publications, including a Washington Post news story Sept. 22 that called Kondik a "respected" political observer. Media outlets focus repeatedly on just a few of the nation's thousands of professors whose expertise is relevant to current affairs. Wecht replied that neither the Sabato nor Shenon book documents any specific reference to new “21st century forensic science” studies that prove that Oswald was the lone gunman in the JFK assassination. "Professor Sabato must know this, and so do you," Wecht continued in blunt correspondence with Kondik that is reprinted in full below. "To slough me off as if I were some unknown simpleton is highly insulting," continued said the 86-year-old Wecht, who has authored or co-authored more than 50 books, taught medical students, and served as head of medical societies, among other accomplishments.This weekend, he is in Key West performing what he described as his 420th autopsy of the year. "More importantly," Wecht wrote, "is the harsh fact that Professor Sabato and Mr. Shenon have publicly expressed a statement that is untrue. Millions of people who have read their article are now misinformed." Another professor and author, Dr. David Byron Thomas, separately has described the supposed findings of Sabato and Shenon as entirely unsupported and as best described as "fake news." More generally, this debate is important because it involves specific facts that are widely neglected elsewhere, whether in media, museums, universities or other institutions that we in the public naturally assume are studying such matters in a rigorous and unbiased manner. But this editor's experiences with Newseum staff, including an author lecture and a separate preview of the photo exhibit during VIP preview this summer primarily for museum donors, indicated minimal interest from the museum's expert research staff in hard questions about JFK's death, including why CIA, FBI and other agencies have fought so long and hard against document releases and exploring tough questions. 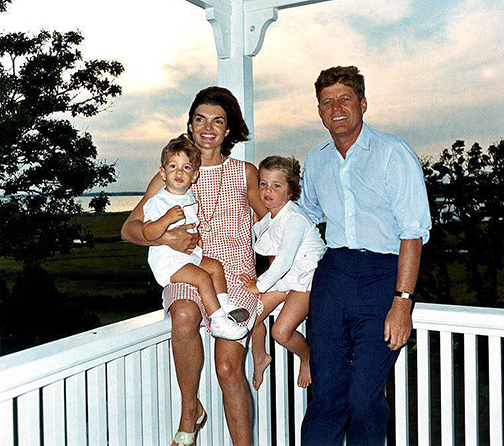 Instead, the museum focuses primarily on the more marketable legacy of the fondly remembered Kennedy era of glamor, idealism and "Camelot," as indicated by the title of the photo exhibition. Our column today primarily covers the specific dispute over scientific evidence. Contending are a camp of JFK scientific researchers typified by Wecht against Sabato, Shenon and those in the mainstream media who promote them. Our follow-up column, Part II, will address in greater depth the major financial reasons why so little discussion occurs in so-called prestigious media and academic circles regarding scientific evidence in the JFK case, even from ostensibly independent media outlets. As a preview, the track record of these outlets for decades has shown that they either ignore evidence challenging the Warren Commission or deride proponents of such evidence as "conspiracy theorists." Our two columns thus focus narrowly on scientific and related media aspects of the current controversy. But this dispute inevitably raises the background questions of why Kennedy was killed and why the mysteries surrounding his death continue to percolate in more than 2,500 books so far, plus countless movies, articles and other debates. These are highly relevant to a host of issues, including the current Public Broadcasting System (PBS) series The Vietnam War, directed by Ken Burns and Lynn Novick. This is a 10-part series that began on Sept. 17. It omits JFK's growing opposition to war, according to critics familiar with advance screenings of the series or the episodes shown so far. Our Justice Integrity Project, now in collaboration with the Wecht-chaired research group Citizens Against Political Assassination (CAPA), addresses these larger issues in a Readers Guide to the JFK Assassination. The Readers Guide started in 2013 during the 50th anniversary retrospectives of the Kennedy death and legacy. The Readers Guide consists so far of 40 columns. One column lists the major books and features all significant viewpoints, including the Warren Commission's view that Oswald alone killed JFK because of Oswald's supposed Communist views and disordered personality. In related news, CAPA announced this week that registration is open for the mock trial State of Texas vs. Lee Harvey Oswald that CAPA has been organizing for civic education from Nov. 16-17 on the campus of the South Texas College of Law in Houston, which is the co-sponsor. Registration is here. Beginning on Sept. 25, the college website www.stcl.edu/oswald will be the site for registration. 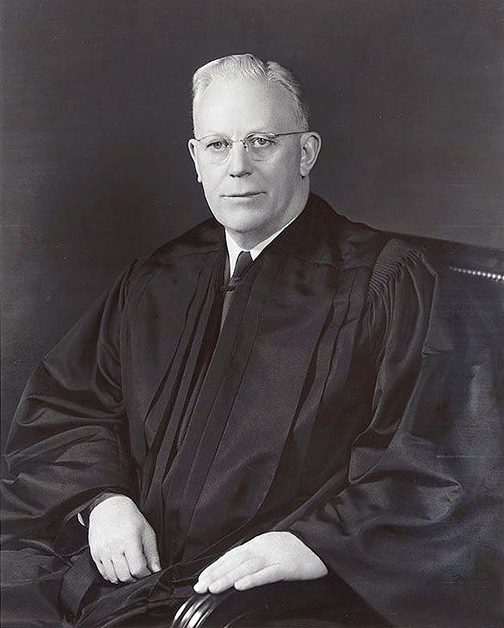 In 1963 after Kennedy's assassination during a presidential motorcade through downtown Dallas, incoming President Lyndon B. Johnson appointed a seven-member Warren Commission led by Supreme Court Chief Justice Earl Warren to investigate the killing. The commission issued its "Warren Report" in September 1964 to universal acclaim by the media even before any of them had time to read the findings and evidence contained in 26 volumes. The material appeared to confirm the conclusions of FBI officials and other law enforcers made immediately after the shooting and pinning the blame entirely on Oswald. 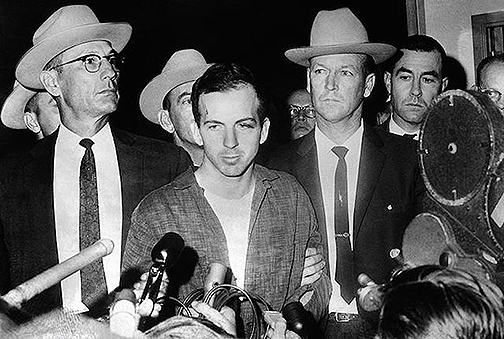 The major findings included assertions that: 1) Oswald acted alone in killing the president with three shots fired from behind with a bolt-action rifle; 2) Oswald acted from pro-Communist motives and disordered personality; and 3) Jack Ruby — who killed Oswald in a Dallas police station two days after JFK's killing — had no connections to the mob. 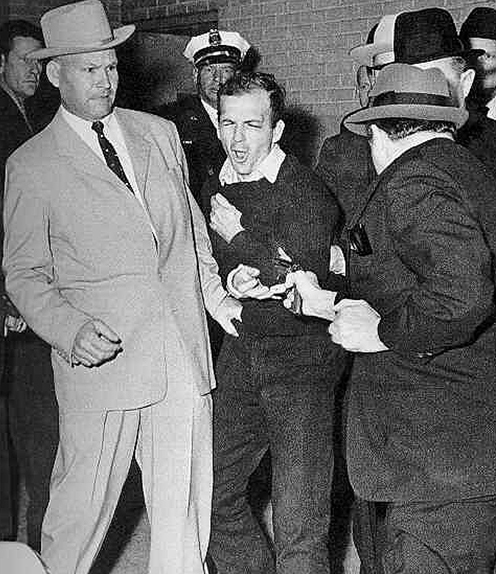 The commission's claim about Ruby (shown below killing Oswald) is largely beyond the scope of this column. First, virtually all serious researchers describe the whitewash of Ruby's mob connections as one of the most demonstrably false parts of the commission's report. Ruby had been a longtime associate of top Mafia leaders in Chicago and New Orleans, including New Orleans mob boss Carlos Marcello, whose turf encompassed Dallas. The practical results of whitewashing Ruby's past include removing from public discussion, at least initially, the possibility that Ruby might have been ordered to kill Oswald by others. Investigation of any such order to kill would have opened, in turn, a Pandora's Box of what we now know as strong working relationships during that era between various anti-Communist allies. That anti-Communist web included Kennedy-haters among Big Business (including the defense sector and in Texas, New Orleans and other parts of the South), the mob, the Cuban exile community and the CIA. The agency had sub rosa working relationships with each of those groups that were focused heavily on mutual desire to overthrow Cuba's Communist leader Fidel Castro, as many declassified documents, books and whistleblowers have revealed through the decades. Evidence now strongly suggests also that Oswald was merely pretending to be a Communist in his role as a low-level asset for military and law enforcement handlers. That latter job alone during the Cuban Missile Crisis is enough to prompt suspicions that Oswald could not really have been merely the Communist sympathizer that he claimed to be. During a super-secret meeting of the Warren Commission on Jan. 22, 1964, Dulles is quoted as advising other commissioners that they must squelch for the good of the country the rumors at the time in journalism and law enforcement circles that Oswald had worked with authorities. The official transcript was halted, but another one has surfaced. 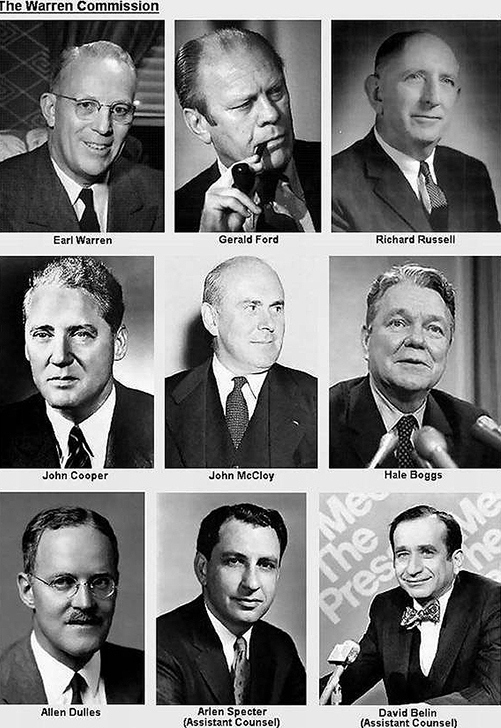 Warren is shown in a photo collage above along with six other commissioners and two staff counsel (Arlen Specter and David Belin, shown in the bottom row at center and right). The staff performed much of the work under Chief Counsel Lee Rankin while the commissioners were busy with their day jobs for the most part. The one commissioner without a full-time job then was Allen Dulles, the former CIA director whom Kennedy had forced out of office in late 1961 along with two top CIA deputy directors, Richard Bissell and Gen. Charles Cabell, brother of then-Dallas Mayor Earle Cabell. Kennedy was furious over their war-mongering and attempts to mislead him, records and witnesses now show. The mayor had had his own relationship with the CIA as a secret asset beginning in 1956, according to a document released this summer by the National Archives. Larry Sabato is director of the University of Virginia Center for Politics and author of The Kennedy Half-Century, a 603-page book published in 2013 and released in tandem with an educational website intended as a major national venue for JFK historical research. Important decision-makers with strong funding sources have clearly positioned Sabato and his viewpoints as a leading academic voice in shaping public opinion on Kennedy, his death, and legacy. Sabato writes in his book that a variety of ballistics, medical and other scientific evidence exists regarding the assassination but that it is hard to assess, in part because too much of the most vital material has been suppressed. Sabato writes (on page 241) that he therefore decided to focus his "advanced analysis" on a Dallas police Dictabelt, which was an audio recording made during JFK's Dallas motorcade. Thus narrowing his "advanced" focus to that topic, Sabato gives the Dictabelt extended treatment (pages 241 and 248), including the results of special acoustics research by a lab. On that basis, Sabato concludes that the Dictabelt does not document four gunshots (as some have argued) compared to the three gunshots that the FBI and Warren Commission concluded that Oswald, and Oswald alone, fired from the rear. The House Select Committee on Assassinations (HSCA), a successor to the Warren Commission and the most recent official investigation of the JFK killing, concluded in 1979 that there may have been four shots, partly on the basis of the Dictabelt. The HSCA thus suggested that "conspiracy" was a possibility. Sabato treats other scientific data in a chapter "Examining the Physical Evidence" (pages 208 to 230), which concludes that the physical evidence is inconclusive. In essence, his default position in his book and columns thus uses the Dictabelt evidence to undermine Warren Report critics and rely for the most part on the official story. He does keep his options open by the raising the possibility that new evidence may turn up proving critics correct. Yet Wecht and most other critics of the Warren and HSCA Reports focus their forensic investigations most heavily on bullet and medical evidence. Wecht is a prominent forensic pathologist and author, as noted, and also a consultant, attorney, and former coroner who continues an active practice of autopsies, public speaking and civic leadership. Wecht has long argued that forensic evidence proves that Oswald could not possibly have fired from the rear the fatal shot killing Kennedy and wounding Texas Gov. John Connally, who was sitting in front of Kennedy during their motorcade through downtown Dallas. Wecht is supported by other medical doctors experienced in gunshot wounds and autopsies, They argue that the official story -- particularly coming from the FBI and the Warren Commission, which relied for the most part on the FBI -- is physically impossible and so there must have been another shooter besides Oswald, even assuming that he was a gunman and not a total patsy. To illustrate that these matters are not personal and simply fact-based, Wecht proudly states that he remained friendly until death with the late Pennsylvania Sen. Arlen Specter, the staff counsel on the Warren Commission most responsible for devising and arguing the "Single Bullet Theory" blaming Oswald exclusively for the multiple wounds inflicted on Kennedy and Connally. 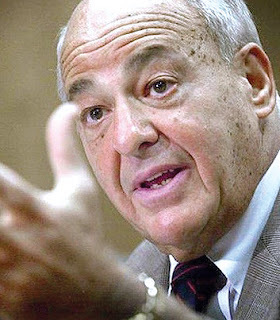 Wecht, who frequently lectures against that theory, notes also that the Vincent Bugliosi, a former Los Angeles prosecutor who authored the 1,612-page 2007 book Reclaiming History defending the Warren Report, asked Wecht to deliver a eulogy at his funeral. Nonetheless, Wecht remains perturbed that Sabato and Shenon remain relatively unchallenged in the media for their views. 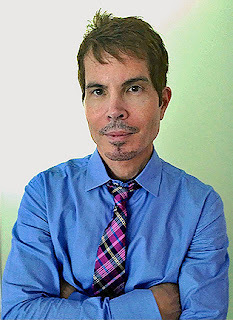 Shenon, Sabato's collaborator in the columns this summer, is a former Washington correspondent for the New York Times and is the author of the 625-page, 2013 book A Cruel and Shocking Act: The Secret History of the Kennedy Assassination. The Boston Globe this summer quoted Sabato and Shenon as the only two experts in a major news story about JFK research, What we know about the newly released JFK assassination records — and those yet to come. (The Globe reporter failed to respond to our question why, or whether he quoted other experts in any other story.) Among other critics of Sabato and Shenon this summer have been Dr. Donald Byron Thomas, shown at left. 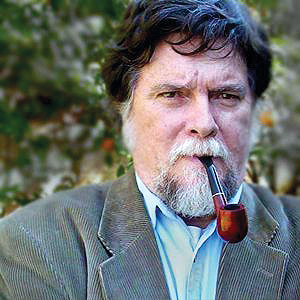 He is a professor and author of Hear No Evil: Politics, Science and the Forensic Evidence of the Kennedy Assassination, a 767-page book in 2013 about acoustical evidence in the JFK murder. Thomas is a board member of the Assassination Archives and Research Center (AARC) and co-authored with researcher Malcolm Blunt and Dr. Gary Aguilar last month a column published on the organization's website: AARC Board responds to Sabato and Shenon. A novice reading that statement would likely conclude that there have been recent (since 2000) scientific studies that incriminate Lee Harvey Oswald in the JFK murder case. But there are none. Not one. There is not even one that claims to be. There have been excellent (and otherwise) forensic studies on the JFK evidence in recent years, but none of them inculpate anyone. In short it is a Trumpism – made up – fake news. Shenon and Sabato’s bald claim about the forensics is an alternative fact, the very sort of invention the Washington Post should be striving hard to avoid. Sabato and Kondik have so far failed to respond to our requests for comment for this column, much like they reportedly ignored Wecht's request aside from the email traffic excerpted above and displayed below at greater length in an appendix. That PBS show was NOVA: Cold Case JFK, One-hour NOVA broadcast, first broadcast on Nov. 13, 2013. NOVA describes itself as the nation's most widely viewed science program. We shall explore in Part II of this series the show's funding and staffing. For now, we focus purely on its two historical consultants: Dr. John McAdams and Gerald Posner, who have each advocated that the Warren Commission was correct in concluding that Oswald acted alone to kill Kennedy. McAdams and Posner are prominent as commentators on the JFK killing but also notorious among many fellow researchers for the relentless nature of their advocacy of the official story and their attacks on other researchers. Also, they have each been tainted with questions about their professional approaches. More specifically, Marquette suspended and then terminated McAdams as an associate professor because of what the university described as abusive behavior towards students with whom he disagreed politically. Posner, an attorney and author shown in a file photo above right, resigned as chief investigative reporter for the Daily Beast in 2003 after allegations of plagiarism. As noted above, these issues are timely because Oct. 26 looms as the deadline for final release of JFK assassination documents by the National Archives, as required by a unanimous vote of Congress in a 1992 law passed because of public outrage over the case following Oliver Stone's 1991 film JFK. The National Archives announced its first batch of 2017 disclosures on July 24 via National Archives Begins Online Release of JFK Assassination Records. The dispute raises larger questions about the role of such media outlets as PBS, Politico, the cable channel History, and the Washington Post in slanting coverage to bolster the Warren Commission's controversial findings, in part by relying on a few supposed experts who support the report and marginalizing those like Wecht and a number of others who have been attacking the Sabato-Shenon thesis this summer. In May, the cable channel History launched a six-part series entitled JFK Declassifiednarrated by former CIA operative Robert Baer. 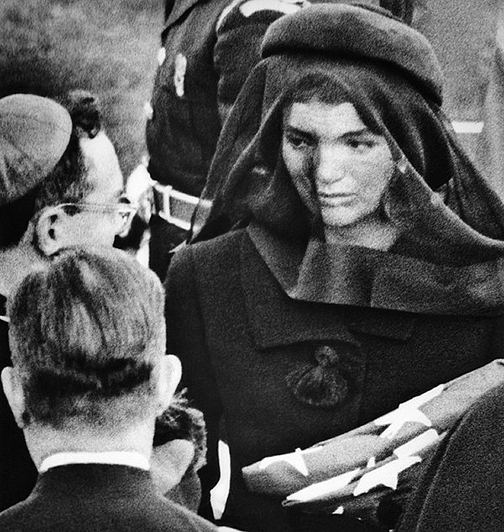 But History pulled the show following two episodes after widespread criticism for promoting the disputed theory that Oswald killed Kennedy and that Oswald's actions were motivated by Communist sympathies and encouragement from either Cuban or Soviet authorities. 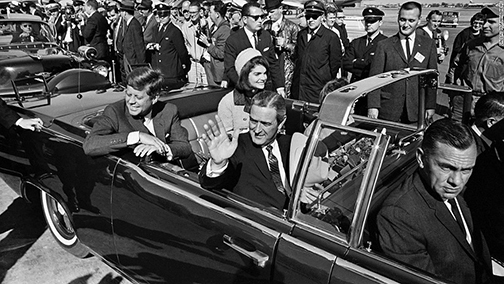 Beginning in April, the analytic website Kennedys & King, published and edited by author James DiEugenio, published a six-part series harshly criticizing the factual basis of the History series, whose first segment was JFK Declassified: Tracking Oswald. As a further preview to our Part II, we note that the Justice Integrity Project has documented a pattern whereby major outlets repeatedly confirm the Warren Commission's claim that Oswald killed Kennedy. Among many examples that we have documented in previous columns are Major Media Stick With Oswald 'Lone Gunman' JFK Theory (Nov. 27, 2013), Nearly Too Late, Public Learns of Bill Moyers’ Conflicts Over PBS, LBJ (Jan. 2, 2014), Why Bill O'Reilly's Lie About JFK's Murder Might Matter To You(March 17, 2015) and Time Magazine, History Channel Ramp Up Oswald-JFK Fake News (April 26, 2017). These are collected in our our so-far 40-part "Readers Guide to the JFK Assassination surveying nearly all major books, films, archives, events, and points of view. That series is excerpted at the bottom of the appendix below. Our next installment in the series will examine media coverage in more depth, as noted. That includes the 2013 PBS NOVA episode Cold Case JFK that Shenon has cited as compelling. In sum, "Fake news" and "conspiracy theory" sound like terrible things no matter what the topic. But they are all the worse if unexamined, especially in the context of such a notorious crime as JFK's murder. Disclosure: This editor is a founding volunteer director of the research group CAPA while continuing to pursue a long career as an independent journalist, lawyer, and strategist. That work has led to professional correspondence or meetings with most of those cited in this column. 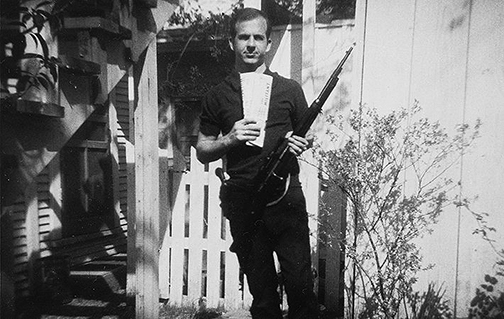 As noted above, scientific issues will be explored also in a mock trial, "State of Texas v. Lee Harvey Oswald," from Nov. 16-17 on the campus of the South Texas College of Law in Houston, which is the co-sponsor with Citizens Against Political Assassinations (CAPA). Dr. Cyril Wecht is among the experts being called in the case to testify. Registration is here.